Owls are associated with superstition and in many African folktales are seen as purveyors of evil. Many people in rural communities put spikes on the roofs of their homesteads to prevent owls from landing on them at night. Owls are still considered agents for witches or sorcerers, and the arrival of an owl at one's homestead is taken as a bad omen. Owls are prized as ingredients in traditional medicine because of their perceived wisdom, hunting skills and remarkable eyesight. They are also relatively easy to capture by day. Owls mostly operate at night. When seen during the day, they are usually perched silently in tall trees. Although they all have large, piercing eyes - which can see exceptionally well in the dark - owls depend mostly on their hearing to pinpoint their prey. Owl ears are misleading - the tufts of feathers on their heads have nothing to do with proper hearing. Their ears are usually positioned in disc-like depressions on either side of the head which have the effect of funneling sound. Owls are generally associated with well-developed woodland, particularly where it is close to riverine forest and rocky hills. The most common owls in Kruger are the Barn Owl and Verreaux's Eagle-Owls*, which are recorded throughout the Park. Verreaux's Eagle-Owl* is the largest owl in Africa, yet is remarkably dexterous for a bird its size. Raptor expert Peter Steyn says it's capable of doing a 'vertical somersault to catch a passing beetle in the air'. It is found mostly in the south where it nests in large trees by day, emerging at dusk to hunt. The bird is a potent symbol in Shangaan folklore. Known as Nkhunsi , the Eagle-Owl is viewed by the superstitious as a messenger of death sent by a malevolent person. Some sangomas say that the only way to undo the death spell is to catch the owl and sever the head. In this way the sender of the original ill-fortune would suffer terrible consequences, either their own death or that of a close family member. The Verreaux's* glides effortlessly between elevated perches, looking around for prey. When it spots something it will swoop down and grab it with its powerful talons, kill it and eat it on the ground. It also hunts on foot and feeds in shallow water for frogs and fish. Verreaux's Eagle-Owls* have a varied diet - they will eat anything and everything. They have been known to have killed a roosting Secretarybird, attacked an adult vervet monkey and taken a warthog piglet. One of their delicacies is hedgehog - they use their beaks to neatly peel away and discard the spiny skin before eating the flesh. It is a robust bird perhaps with ambitions above its station - there is a documented report from east Africa of a Verreaux's Eagle-Owl* challenging a rhino! It puffed up its feathers and threatened the perplexed beast when it came too close. Largest owl, pale grey with noticeable ear tufts; pale face with a black rim; dark eyes with pink eyelids; grey beak. Omnivorous; hunts at night attacking roosting birds in trees or animals on the ground; eats springhares, genets, mongooses, bats, rodents, insects, frogs and fish; among the birds it eats are African Harrier-Hawk*, African Black Duck, Korhaan, Southern Yellow-billed Hornbills, doves, pigeons, bulbuls. Widespread in Kruger but mostly open acacia savannah in the south; along Sabie River; also in the north around Letaba and on Shingwedzi floodplains. Named after the Dutch naturalist and one-time governor of the Gold Coast, HS Pel, this owl is the most elusive of Kruger's Big Six birds. It is nocturnal and easily overlooked during the day when pairs hide in the canopy of tall, riverine trees. Pel's Fishing-Owl will rarely emerge before nightfall - it is mercilessly attacked by the African Fish-Eagle if it is exposed during the day. They have an almost exclusively fish diet, hunting from sandbanks or low branches overlooking pools of slow-moving water.They will swoop down and seize a fish from just beneath the water's surface, using their long, curved, specialised talons. Unlike most other owls, Pel's usually calls only after midnight and mostly just before dawn when it returns to its daytime roost. Juveniles have a particularly eerie call that, in Steyn's words, sounds like the 'cry of a lost soul falling into a bottomless pit'. Large owl with darkly flecked, rufous plumage; black eyes and dark beak; no ear tufts. Almost entirely fish, mostly barbel, squeekers and pike; occasionally frogs, crabs and freshwater mussels. Limpopo, Luvuvhu and Olifants Rivers; near Balule; less frequently seen along Letaba, Shingwedzi and Sabie Rivers. The Spotted Eagle-Owl is a medium-sized owl usually found near rocky ridges in a variety of woodland habitats. During the day, it roosts in trees or on the ground, often making use of abandoned aardvark lairs. It is well disguised with its flecked, rufous coat blending in with the dappled bushveld sunlight. At night, the Spotted Eagle-Owl hunts for insects and small animals among the rocks. It is capable of catching birds in flight but also feeds on the ground. It will even attack and eat poisonous snakes. It often takes a moonlight bath in shallow streams. Spotted Eagle-Owls have a mellow, hooting call and duets between mates are an integral part of the courtship ritual. Once committed, they remain partners for life. Large owl; streaky grey with distinctive yellow eyes; noticeable ear tufts. Eats a wide variety of small animals, mostly insects but also small mammals, frogs, reptiles, fish and carrion. Near rocky outcrops, most common along upper Luvuvhu River; Pretoriuskop; Berg-en-Dal and along the Lebombo. Barn Owls are common owls found throughout the Park. They comfortably co-exist with humans and often nest close to rest camps. They like to build their nests in rock crevices close to riverine forests, but will sometimes take over abandoned Hamerkop nests. Barn Owls are particularly active when there are lots of rodents about. They hunt only from dusk as they are targeted by raptors if they emerge during the day, particularly by the Wahlberg's, Tawny and African Hawk-Eagles. The Barn Owl hunts by gliding low over the ground or hopping between perches and occasionally beating bushes to try and flush out smaller birds. Research has shown that a Barn Owl's daily food consumption is about 55 grams. It regurgitates one pellet every day, disposing of all the indigestible bits of its prey. There is a close bond between pairs, which will remain at a single nest for years. Medium-sized owl with golden buff and pale colouring; distinctive heart shaped face with black eyes. Rodents make up seventy-five percent of its diet; also birds, lizards and frogs; in Namibia they prey a lot on scorpions. Variety of habitats; often near camps. The Marsh Owl is common in Kruger, particularly in wet years and when rodent populations in the Park increase. It is one of the owls one is most likely to see because it is less nocturnal than other owls and is often seen in the late afternoon when it emerges from its nest to perch and preen, although it hunts mostly at night. It hunts more from the wing than the perch and has been known to catch other birds in flight. Roberts VII notes that it appears to follow the black-footed cat (Felis nigripes) to catch any prey that may be disturbed. The Marsh Owl is found singly or in pairs and has been known to communally roost with other owls of the same species. It generally roosts on the ground in vleis or dense vegetation. Medium-sized owl, male and female similar in appearance with gray facial disc and short, centrally placed ear tufts ; dark brown upper parts and plain brown chest with fine brown barring lower down; eyes, bill and cere are dark brown to black. Most of its diet consists of small birds and rodents - particularly the mole rat - but has been known to take prey up to the size of a striped polecat; often feeds on termites and beetles. Throughout Kruger in open thorn savanna; found surprisingly in arid grassland as well as marshy areas, favours thick grass, reeds and sedges. The African Wood-Owl is rarely seen during the day and is pleasantly vocal at night. Its call is a 'who-who, who-who-who are you?' During breeding season, partners engage in duets, starting just after sunset and persistently carrying on until dawn. The African Wood-Owl roosts in thick bush by day and doesn't emerge until after dark. It hunts from a perch, swooping on prey on the ground, and also hawks insects in mid-flight. African Wood-Owls are very family-orientated birds - a family group may operate together for four months after the young have left the nest. Medium-sized owl with a round head, pale facial disc with large black eyes, and mottled brown plumage. Mostly insects such as termites, moths and beetles; also small rodents, frogs and birds such as kingfishers, Yellow-bellied Greenbul and Fiscal Shrikes. Well-wooded areas near water and dense, riverine forest, particularly along the Luvuvhu and Sabie rivers. The pitch of an owl call is relative to its size. Small owls utter higher calls at a frequency that doesn't carry very far. Larger owls call with deep hoots of a low frequency that can be heard kilometres away. The range of the owl's call is related to the size of its territory. The Southern White-faced Scops-Owl* is small but often easier to see than other owls because it doesn't conceal itself completely during the day. It is found in a wide variety of woodland habitats, especially acacia thornveld. It begins calling in a long, drawn-out, bubbling hoot during the late afternoon and then becomes active as darkness descends. It hunts by swooping down on its prey from a perch. When alarmed, it growls, hisses and snarls. It forms strong pair bonds with its mate, and pairs often roost in the same tree year in, year out. Smallish owl with very distinctive ear tufts; black streaks on its pale grey body; orange eyes. Insects, squirrels and other small vertebrates; also birds up to the size of a dove. Acacia thornveld in the woodlands throughout Kruger. The African Scops-Owl* is the smallest owl in southern Africa, smaller in size than a dove. It is found in drier savannah woodland, especially mopaneveld. It is very rarely seen during the day, roosting motionless against a tree trunk, well disguised by its mottled grey colouring. It begins to call at dusk and then starts hunting after dark. Most of its diet consists of insects, which it drops onto from its perch, but it also walks about on the ground looking for prey. 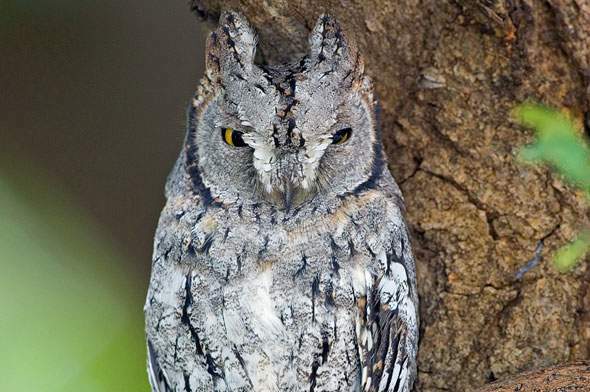 Roberts VII records an instance in which an African Scops-Owl was killed by a group of Southern Yellow-billed Hornbills in a fight over a nesting site. Very small owl; either mottled grey or brown with distinctive yellow eyes and ear tufts. Feeds mostly on insects such as scorpions, cockroaches, millipedes, grasshoppers and crickets. Kruger is generally the most southern point of the African Barred Owlet's range although there is a small Eastern Cape population that is severely under threat. It is more often found in south-eastern Zimbabwe and northern Botswana. The African Barred Owlet sometimes hunts on overcast days and is frequently mobbed by other birds. Like the Pearl-spotted Owlet, it has a kingfisher-like flight and drops down onto its prey from a perch. It eats mostly insects and small vertebrates. The African Barred Owlet prefers a bushier habitat than that favoured by the Pearl-spotted Owlet. Roberts VII reports an unusual occurence of an African Barred Owlet sharing a hole in a tree with a squirrel! Mostly insects but also known to take rodents, lizards, frogs and small birds. Acacia thornveld in the woodlands around Skukuza and Lower Sabie as well as the dense wooded ridges of northern Kruger. The Pearl-spotted Owlet has a remarkably loud call for such a little bird. It also has disproportionately large feet, which enable it to catch and kill prey its own size. The Pearl-spotted Owlet is the owl most often seen during the day, moving about openly between trees in a fast, dipping flight. When perched, it sometimes wags its tail and bobs its head up and down. It also hunts at night. It feeds mostly on insects and has been recorded ferreting about in rhino middens for beetles.It roosts in small bushes in savannah woodland and often occupies nests of other birds such as barbets or woodpeckers. It is very territorial and will defend its turf vocally with a vigorous, ascending 'peu peu peu-peu-peu-peu peeuu peeuu peeuu'. Often another bird will pick up the call in a loud duet. The Pearl-spotted Owlet is often mobbed by smaller birds, which see it as a threat to their nestlings or eggs. It is not really known as a nest raider although there have been some documented instances of it looting weavers' nests. Very small; roundish head, big yellow eyes and distinctive white eyebrows; often heard during the day; noticeable false eyes pattern on the back of its head. Feeds mostly on insects and rodents but sometimes attacks bats and small birds in flight. Lightly wooded savannah and grassland throughout Kruger.